FAQ #25. Japanese Mahjong - Why Won't The Computer Let Me Claim Mahjong? Frequently Asked Question #25: "I downloaded a Japanese mahjong game, and I had a great hand going. My winning tile came up, but the computer wouldn't let me claim mahjong. What's up with that?" You don't have enough fan, or you have no yaku (see below). 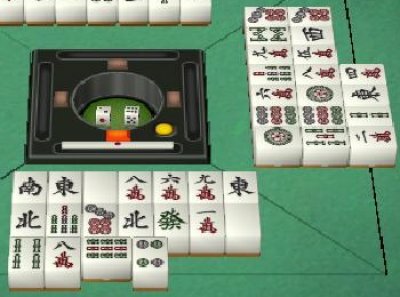 Note: Some computer games will let you claim mahjong despite a furiten or lack of yaku - when you do declare false mahjong, though, an error penalty applies. A penalty error is called chombo, and the penalty is that you must pay 8000 points : 4,000 to the dealer (oya) and 2,000 to the two non-dealers (ko). If you are the dealer, the penalty is 12,000 points: 4,000 to each of the three others. Your computer game may have an optional setting so you can choose to have the penalty apply, rather than have a penalty action merely disallowed. Some players might prefer a realistic penalty (in order to learn more effectively) and others might prefer a more leisurely play experience. Furiten is from the Chinese, meaning "sacred discard." Authors Shozo Kanai and Margaret Farrell, as well as Eleanor Noss Whitney (see FAQ 3) all use the term in reference to a discarded tile, so I previously used the term that way too. But in 2007 I learned from Steve Johnson and Benjamin Boas that in Japan today, the term furiten refers to a state in which the player is forbidden to win on a discarded tile. Steve Johnson explains, "a hand is furiten if it can win on a previous discard, if it can win on a tile thrown previously this [go-]round, or if it can win on any tile thrown since riichi has been declared" (and not claimed by the player when initially thrown). When a player's hand is furiten, the player must not win by discard, under penalty of chombo. 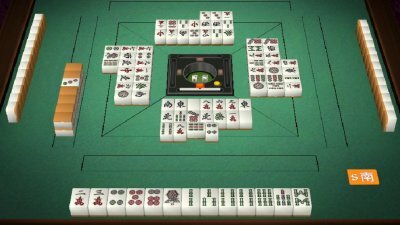 Many Japanese computer mahjong games do not permit the player to do anything that would incur the chombo penalty... Thus inspiring the frequently asked question this article was written to answer. The following text is largely based on the instruction manual for Activision's discontinued computer game Shanghai Dynasty (I wrote the text as an employee of Activision at the time), subsequently heavily edited and reorganized in May of 2007. First, let's examine the three different circumstances that create a state of furiten. The most common type of furiten is when you are ready to win on a tile you previously discarded yourself. For example, if you have a 2-3 sequence (what I call herein an "incomplete connected chow"), you need either a 1 or a 4 to complete it. If you previously discarded a 1 or 4, then the rule is that you are not allowed to go out on the same tile when it is subsequently discarded by someone else. The main reason for this rule is that it is unfair to the other player. Since you had previously discarded the 1 (for example), Japanese players hold that he has a right to expect that it is safe for him to throw a 1 onto the table. If the rule didn't exist and you take it to go out (and subsequently the thrower must pay you), then hard feelings can result (especially when real money is at stake). In the instance illustrated above, if you discard the Eight Bam, you are one tile away from a win (you are tenpai). You are waiting for a One Bam or a Four Bam. Look at your discards. You discarded a Four Bam already, so you would be in a furiten situation if you discard the eight. It would be a penalty mistake (chombo) to declare a win on someone else's discard in this situation. Perhaps it would be better to discard the One Bam instead, and wait for another Eight Bam. Furiten is not limited to tiles that you yourself discard, however. Another type of furiten is a tile that you pass up within one turn of play around the table (what I call one go-around or go-round). If, for example, you have an incomplete Ryanpeikou ("Double Peikou") hand, and you just need to complete a chow, you probably have two ways to complete the chow. One way of completing the chow might give you Ryanpeikou (worth 3 fan) but the other way of completing the chow does not. Let's say you need a 3 or 6 to go out - and let's say that it's the 3 that gives you Ryanpeikou, so the 6 does not. If a player discards the 6, then you can pass up the 6 in hopes of self-picking the 3. But if you do pass up that valid winning tile, then for the remainder of the turn around the table (the go-around), that 6 causes a state of furiten to exist. If another player (before it is your turn again) discards the 3 that you need for the big yaku hand, you must not take it - all the players will know that you passed up on the 6 to take the 3 when you show your hand. The thrower of the 3 is not obligated to pay you - rather, you are obligated to pay the chombo penalty. After you have declared riichi, you may either accidentally or intentionally pass up on a discard that could give you the win. If you do this, your hand is now furiten, and you can only win by tsumo (self-pick). It is a rule of Japanese majan that if a player's hand is furiten, he had better not claim ANY discard to go out. If the tiles you need to win include a tile you had discarded, then do not claim ANY discard for a win. You can self-pick (according to the "Furiten Tsumori Nara OK" rule which may be used by your computer game), OR you can divest yourself of tiles so that the tiles which you need to win do not include any type of "sacred discard." In the example illustrated above, you declare riichi simultaneous with the discard of a One Dot. You are now waiting for either a Seven Dot or a Red Dragon. The Seven Dot puts you in furiten (look at your discards), so you may not declare win if someone discards a Red Dragon - that would be a penalty mistake (chombo). Having declared riichi, you can't change the hand to get out of furiten, so your only hope is to self-pick the winning tile. It can sometimes be difficult to recognize that you are furiten. For example, let's say you have three of a kind, plus one tile above or below it (for example, 2-3-3-3-4, and otherwise your hand has three complete groups-of-three or Kongs). This gives you three chances to go Out, and it's very easy to fail to realize them all. Just looking at your discards is not a guaranteed way of making sure you don't violate the furiten rule; you also need to keep an eye on the other players' melds. The practice of turning claimed tiles sideways makes it easy to spot your own discards among opponents' melds - just don't forget to look there when you're in a possible furiten situation. Here's another example. Let's say you have (all in one suit) 2-3-4-4-5-5-5-6-6-7-7-8-8. You have 5 chances to win: 1,3,4,6,9. Of those chances, the ones that earn you the best yaku are the 3 or the 6. Maybe you realized that the 3 and the 6 were good tiles to win on, but didn't realize that the 9 was a possibility too - then somebody discards the 9 and you don't take it. Then, before it's your turn again, you take a discarded 3. That would be chombo. Some more examples of how hard it is to see all the chances on a Pure hand: 1-2-3-4-5-5-5-6-6-6-7-8-9 (5 chances); 1-2-3-4-5-5-5-5-6-6--7-8-9 (5 chances); 2-3-4-4-4-5-5-5-6-6-6-7-8 (7 chances); and of course 1-1-1-2-3-4-5-6-7-8-9-9-9 (9 chances). If you are working on a Pure hand, and your computer game won't allow you to claim a tile, it's probably because there is a furiten involved. Last example. Let's say you have: W-W-B4-B5-B6-C4-C5-C6-D4-D5-D6-D4-D4. You have 3 chances to win: W, D4, or D7. But if you had previously discarded a W (West wind), you had better not claim any of these 3 chances for a win. You can either get rid of the West winds (thus they are no longer needed to win, getting you out of furiten) or you can hope to pick a winning tile from the wall - or you can just hold out for tenpai at the end, or (more importantly than getting tenpai) even forget about winning, and just make sure you do not throw a tile that lets someone else win. Although not directly a part of the concept of furiten, the 1-4-7 principle is well worth understanding. Always remember that the numbers "1-4-7," "2-5-8," and "3-6-9" are special. Why? Because either of two of them can finish an incomplete connected chow - and any one of them can complete a sequence of five-in-a-row and turn it into two chows. In the following discussion, when I say 1-4-7, I could just as easily be saying 2-5-8 or 3-6-9, so approach this concept with numerical flexibility. Whenever you have a sequence of five same-suit tiles, always check for a 1-4-7 opportunity. Of course, if one end of the sequence is a terminal (a 1 or 9), then it won't be a true 1-4-7. It might be a 1-4 or a 4-7 only. Remember these sequences: 1-4-7, 2-5-8, 3-6-9. Let's say you have the following tiles: C4-C5-C6-B4-B5-B6-D4-D4-D4-D5-D6-D7-D8. On this hand, you have 5 chances to win (all Dots): D3-D5-D6-D8-D9. The 4-5-6-7-8 combination (or any five-in-a-row combination) especially is significant, because even just by itself it gives 3 chances (in this case, 3-6-9) to turn into two complete sets. 3-6-9 is conceptually the same thing as 1-4-7. If you are playing a computer majan game using the Japanese rules, and the computer will not give you the chance to claim a discarded tile for a win, it could well be because your hand is furiten. Look at the discards and exposures and see if perhaps there is a "sacred discard" situation. If you find that this is the case, you can either discard in an attempt to get out of furiten or you can hope to self-pick the win, or you can switch to defensive play. If your hand is NOT furiten, then perhaps the problem is that your hand simply doesn't meet the minimum fan requirement. A computer game that doesn't permit chombo due to furiten also won't permit chombo for any other reason, such as not having yaku. You can earn a yaku either with a combination of tiles, or by some special circumstances or situations that exist when you declare a win. This section describes the situations which earn the yaku bonus. Below you can find illustrations of the special tile combinations which earn the yaku bonus. Going Out on the last tile of the wall ("Haitei") -- When the Wall counter reaches 14, the last tile has been drawn. If the player who drew it completes his hand, s/he earns a one Fan yaku. If that player does not complete the hand with that tile, and discards it, and someone else goes Out on that tile, then that player earns the yaku. Going Out on a loose tile ("Rinchan Kaihou") -- Since there are no Flowers in Japanese Mah-Jongg, the only time loose tiles are taken is when a player melds a Kong (Kan). If the player melds a Kong, takes a loose tile, and goes Out on the loose tile, the player earns a one Fan yaku. Some players apply an optional rule similar to the Haitei rule; the yaku may also apply if the player who drew the loose tile discards it (or any tile from the hand after drawing a loose tile), and someone else can go Out on it (that discard is considered a loose tile, even if it is not the exact tile that the player took from the back of the Dead Wall -- it's kind of like an "indirect loose tile"). But in Shanghai: Dynasty, only the picker of the loose tile is awarded the Rinchan Kaihou yaku. In the case of a thrown tile resulting in a Kong which leads to a Rinchan Kaihou, the thrower of the Kong tile (which set in motion the chain of events leading to the Rinchan Kaihou win) pays for all. Tsumo on concealed hand -- You get a one Fan yaku for self-picking the final tile of a completely concealed hand, in addition to any other yaku that the hand might earn. Reach ("Riichi") -- Going Out after declaring Reach earns a one Fan yaku in addition to any other yaku that the hand might earn. One shot ("Ippatsu") -- If a player declares Reach and then, within one turn around the table, goes Out (either by discard or by self-pick), the player earns a one Fan yaku. In the case of Ippatsu, the player would get one Fan for Reach and another fan for Ippatsu. Of course, this yaku is earned only if the Ippatsu option is selected in the game options. Robbing the kong ("Chan kan") -- Permitted at the moment that a player is promoting an exposed pung to a kong, and only when doing so completes the hand. Considered win by discard. Robbing a concealed kong is usually not permitted (some tables permit it to complete a yakuman hand - some tables permit it only to complete kokushimusou specifically - and the move is only permissible at the moment the ankan is being melded). Double Reach ("Daburu Riichi") -- You earn this yaku if you declare Reach on your original deal (and go Out, of course). All Honor discards, and no takers ("Nagashi Mangan") -- You automatically earn a Mangan bonus if all your discards are Honors and Terminals, and no other player takes any of your discards, and it's a Wall Game. All the tiles run out (the Wall counter reaches 14) -- nobody won, and nobody took any of your discards (even though all your discards were Honors and Terminals) -- you automatically win. Heavenly Hand ("Tenho") -- Dealer goes Out on the initial deal. Earthly Hand ("Chiho") -- You go Out by self-pick on your first deal, within the first turn around the table. Going Out on a discard within the first deal ("Renho") -- Any player except the dealer takes a discard within the first turn around the table and goes Out. Unique Wonders with Thirteen Chances -- If a player is holding "Unique Wonders / Thirteen Orphans" (Koku shimusou) -- and goes Out waiting for the one duplicate tile (there are 13 ways to win in this situation). Heavenly Gates with Nine Chances -- If a player is holding "Heavenly Gates / Nine Gates" (Chuurenpooto) -- and goes Out waiting for the duplicate tile (there are nine ways to win in this situation). Four Concealed Pungs and Waiting on the Head (Suu Ankou Tanki) -- If a player has Four Concealed Pungs (Suu ankou) -- and goes Out waiting for the one tile to complete the pair ("atama" or "head"). The ultimate score is Yakuman Times Six (Four Concealed Kongs (All Winds) with a dragon, winning by waiting for the dragon's mate). Yaku are not exclusive, but rather cumulative. A hand is scored by adding up every possible yaku that may apply to that hand. Note: if a combination is labeled simply "Exposed," then the hand scores the same exposed or concealed (it is understood that any exposed hand is allowed to be concealed). If a combination is labeled simply "Concealed," then it is not allowed to expose that combination (if exposed, it does not score the yaku). Pung of Own wind or Prevailing wind -- and any other groupings to make a complete hand. Pung of any dragon -- and any other groupings to make a complete hand. To win this special hand, your hand must have no Pung, only Chow. The pair must not be a scoring pair -- it cannot be dragons, nor your Own Wind, nor the Prevailing Wind. "Pin Huu" is Chinese for "No Points" -- so the player gets the yaku for having a hand that is so worthless that it's worth something! The last tile you take to win the hand must not be a one-chance -- the player must need more than one possible tile to go Out; it must not be a middle tile of a Chow, and must not be the other-end tile of a terminal Chow; and must not be a tile to complete a pair (or "head"). Some players require the last tile to be self-picked, but in Shanghai: Dynasty this is not a strict rule. If Pinfu is self-picked, the player gets the extra fan (yaku) for Tsumo On Concealed Hand but does NOT get the extra 2 points for self-pick. Player also gets the Tanyao bonus on this hand if it's all Simples. No ones or nines, no Winds or Dragons. Two same-number Chows in any one suit. Above, how Iipeikou would look in the hand. Hand contains same-number Chii (Chow) in all 3 suits. Three sequential Chows (1-2-3, 4-5-6, and 7-8-9) in one suit. A "Terminal Chow" is a Chow (Chii) with a one or a nine in it. If all-terminals-and-honors hand has no Chows, it does not earn "Chanta" but rather "Honroutou." To earn this yaku, the three Pungs must be completely concealed in the hand at the time of going out. Must go out by making the pair or the fourth grouping (Pung or Chow). Same-number Chows (Chii) all in the same suit. Effectively the same as "Sanrenko" (Three Sequential Pungs in One Suit), which scores the same, if concealed (player is scored only for the one yaku, not both). But if one of the Chows is melded, then obviously the hand cannot be regarded as Sequential Pungs. If concealed, an All Pung hand also (by definition) earns two more Fan for Sananko (Three Concealed Pungs). Pungs of two dragons, and a pair of the third dragon. You would also earn two more Fan for having Toi-Toi (All Pung) with this combination. Could also be thought of as three identical Chows in one suit (Iisou sanjun), if concealed -- but player gets scored only for one of the two (San renkou or Iisou sanjun). Seven different pairs of anything. Two identical pairs not permitted (and certainly no konging of any kind is permitted). Same-number Pungs in all three suits. Two identical Chows in one suit, and a different two identical Chows in a second suit. One suit, plus Winds and/or Dragons. Each grouping in this hand has a one or a nine in it somewhere. Every tile in the hand is from the same suit (no Winds or Dragons). Pungs of Ones and Nines, plus 2-3-4-5-6-7-8 and any one tile, all the same suit. In the Japanese game, the winner's Own wind is allowed to be either a Pung or the Pair (Head). Pungs of all of the Dragons. Four kongs and a pair. The Green Dragons are optional -- they can be used for a Pung or a Pair, or not be used at all. Pungs and a pair of ones and nines only (kongs allowed). Pungs and a pair of Winds and Dragons (kongs allowed). Above, shown as it would look in the hand. One of each of the ones and nines, plus one of each Wind and Dragon, and a duplicate of any tile in the hand. To qualify for this hand, the player cannot take a discard to complete a Pung (because taking the discard to complete the Pung causes that Pung to be considered Exposed). The player would have to self-pick the final Pung tile, else go out waiting for the Head (which would be worth Double Yakuman -- Suu Ankou Tanki). Pairs of twos through eights in one suit. Kongs are allowed too -- they do not disqualify the hand from earning the yaku. Only valid on the initial deal, and only for dealer's initial hand. Hand has thirteen unrelated tiles (odd Honors or Terminals, for instance, and/or numbers separated by 2 or more numbers, like 1-4-7 or 2-5-8 or 3-6-9; 1-4-8, 1-5-8, or 1-5-9 for example; nothing in the hand can be easily turned into a Chow or Pung). Hand is total garbage, in other words, which will be nearly impossible to turn into a winning hand of Pungs and Chows. The 14th tile may match any tile in the hand. Pungs (and/or kongs) of all four Winds and a pair of anything. >In the Japanese Modern Rules of mahjong I have a question about the Dealer's Counter (the 100 point stick that goes up by one every time the Dealer wins a round).� When a non-dealer wins, do they get the bonus (300 pts per stick), or is it just reset to zero - and the deal is passed?� When it is a drawn hand (and the dealer has tenpai) or a null hand, does the dealer get the counter points?� Does the count stay the same or go up by one for the next hand? >Also, in terms of the Yakitori penalty, is there a standard penalty amount or is it decided by the players ahead of time? >Sorry, an addendum to my last question about the Dealer's Counter.� Most rules state that after the dealer repeats 5 times, a 2 Yaku hand is required in order to go out.� Is this for the dealer only�or for the whole table?� Do counters keep being added beyond this or is there a limit? When it is a drawn hand (and the dealer has tenpai) or a null hand, does the dealer get the counter points? Does the count stay the same or go up by one for the next hand? Rules may vary. My group adds one. in terms of the Yakitori penalty, is there a standard penalty amount or is it decided by the players ahead of time? I imagine it's a house rule. My group uses 1500 points. after the dealer repeats 5 times, a 2 Yaku hand is required in order to go out. Chigau. The hand can have one or two yaku (or even more) - the minimum fan goes up from 1 to 2. Don't get yaku and fan confused. Is this for the dealer only�or for the whole table? Nothing applies solely to the dealer and nobody else. Do counters keep being added beyond this or is there a limit? >Thank you for the quick reply!� One more question for Modern Japanese Mahjong.� If someone scores a limit (Yakuman) hand, would they still get points collected on top of it for someone else's Reach declaration, or Dealer Counters?� Or is this limit considered "the limit"? Yes, the winner would take the riichi chip(s) and collect for dealer markers. >Also, in terms of the 4th kong, when does the game count as having ended?� Does the player making the kong discard?� Can someone else claim this discard? >In an aborted/drawn game do�the reach points carry over to the next round or do they just not count? >One more, do fans from Doras count to meet the 2 fan minimum if the dealer has been the dealer for more than 5 rounds?� Or just fans created from Yaku? >Sorry for the deluge of questions! I have no idea why anyone would make a 4th kong - the situation has never come up, and I've never thought about it. Maybe it could be a defensive move to stop a game that was bound to be lost otherwise. But if it's at that point in the game, the player who makes a kong risks giving someone else an opportunity to win by robbing the kong, so I don't see a particular advantage in doing it. Probably. I don't know. The situation has never come up, and my friends aren't good at explaining, and there's no really comprehensive description in English anywhere. Can someone else claim this discard? I assume so - it effectively becomes the haitei (the last tile of the hand). In an aborted/drawn game do�the reach points carry over to the next round or do they just not count? They carry over. The riichi stick goes to the right corner of the dealer (where dealer markers are displayed). No. Never. The dora doubles are applied only after winning based on yaku.Dora NEVER count as yaku. Period. >> What would be the strategy in claiming a 4th kong? >> continues (and no-one can make further kongs). >> that danger currently exists). >> Does the player making the kong discard? >> better be sitting with a safe discard in the likely case you don't go out. >> Can someone else claim this discard? >>�- Yes. But there is no special (e.g. haitei) yaku for claiming that tile. >> The player would need an ordinary yaku like always. >Thank you both so much!� This game is so endlessly fascinating. Great, thanks Tina! Definitely looking forward to seeing a translation of the Mahjong Denmark Riichi booklet. I'll add a link to the summary sheet in FAQ 4b. Cheers! >One more question about the Dealer Counter in Modern Japanese Mahjong.� If the wall is exhausted and the dealer is in no-ten, the deal the passes to the next person.��If the previous dealer has been in that position for more than one round, does the new dealer�then "inherit" all of counters from the previous dealer� - and add one -�until someone finally goes out?� Are all the unclaimed "Reach" points (if any) passed along as well until someone goes out? does the new dealer�then "inherit" all of counters from the previous dealer� - and add one -�until someone finally goes out? Yes. The markers are only indicators, not necessarily money to be paid by the dealer. So the old dealer puts his markers back in his drawer, and the new dealer puts up markers from his drawer. Are all the unclaimed "Reach" points (if any) passed along as well until someone goes out? Yes. Those chips belonged originally to the players who declared riichi and will go to the eventual winner. > Iipeikou as well as 2 Fan for the 7 pair� ? Let me draw you a picture to show you why the answer is no. This shows "2 sets and 4 pairs." There's no such hand structure! You can only make "4 sets and 1 pair" or "7 pairs" or "12 singles and 1 pair" (kokushimusou). The answer is no. Those 6 tiles are either 2 chows OR 3 pairs - they cannot be both at the same time. And as you can see by the illustration above, the 2 chows option is not a valid option. They can only be 3 pairs in this case. I think I'll tack this onto FAQ 20. Available at bookstores, BN.com, and Amazon.com. >I need a clarification about scoring.�� In our game, my friend was in tenpai with�a "hon iisou" hand that was concealed, but she won on a discard.��� Because the entire hand was concealed before she won on the discarded tile, she thought she should get 3 yaku for a concealed hand.��� I thought she should get only 2 for an exposed hand, since she won by discard.���Could you clarify this?� I can't remember what unit the tile completed--a pon, pair or chi--would that make a difference?���� If the winning tile completed a pon, then we would technically score that pon as "exposed," right?�� So the hand could not be "concealed." Because the entire hand was concealed before she won on the discarded tile, she thought she should get 3 yaku for a concealed hand.��� I thought she should get only 2 for an exposed hand, since she won by discard. The hand counts as concealed because she had no exposures prior to winning on the discard. She's right - she gets 3 fan (not 3 yaku). So the hand could not be "concealed." The following points apply to regular Mah-Jongg hands that add up to 5 fan or less. After arriving at total points, if result is not divisible by ten (except in case of 25 points for 7 Pairs), then round UP to the nearest multiple of ten. Add up the fan, then look up the score in the appropriate chart. An important fine detail: when you go Out on someone's discard, the grouping completed by the discard is considered to be exposed (for point-scoring purposes). The hand itself, however, is still regarded as concealed, if no melds were made prior to going Out. And that "important fine detail" is precisely what you needed to know, Marissa. Oh - and about the fan / yaku thing. Hon iisou is a yaku that's worth 3 fan when concealed. So a yaku is a "scoring element" (an aspect of the hand or the method of winning that earns one or more score-doublers). And a fan is a "score-doubler." You and your group need to un-learn the terminology you had been using, so you can use it correctly going forward - but you all sound really smart to me, so it should be no problem. Now get back in there and ganbatte kudasai! In the Tsumo section of the Non-Dealer chart [above], the Dealer and 2 non-Dealers will pay the winner. The top number is the non-Dealer payment amount; the bottom number is the Dealer payment amount. In the Ron section, the number indicates how many points the thrower pays the winner. The entire 5-Fan row, half of the 4-Fan row, and one square of the 3-Fan row, is a "Limit" (Mangan) zone on the chart (the shaded area). 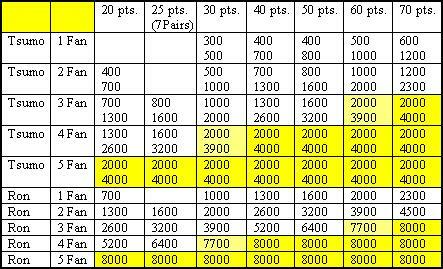 You may notice that at 30 points and 4 Fan, the payment is nearly the same as if the winner had gotten "Mangan" (Limit). These special "close enough" scores are highlighted in a lighter shade of gray on the chart above; Shanghai: Second Dynasty follows the standard practice in rounding these scores up. Since 7700 or 7900 is so close to 8000, it is simply called Mangan and the two non-dealers pay the limit (4000 points). Similarly, if a dealer scores 11,600, that is regarded as being Mangan ("Limit"). If the winner gets more than 5 Fan, the following chart is used (points for going Out and for tile combinations are disregarded-only the Fan count is important above Mangan). Haneman is one and a half times Mangan. Baiman is Mangan times two. Sanbaiman is triple Mangan. Yakuman is quadruple Mangan. Just as points are no longer counted above Mangan, so too are Fan no longer counted above Yakuman. Players are not awarded "Yakuman + 3 Fan," for instance. There are two special cases in scoring -- Pin-Huu (Japanese: "Pinfu") with Tsumo (self-pick) and Chii Toitsu (Seven Pairs). Pinfu - The Tsumo win would normally be worth 2 points, but "Pinfu" literally means "no points." You get a Fan for Pin-Huu anyway, so the Tsumo points are not awarded when you get Pinfu. Chii Toitsu - Player earns the 25 base points only - no additional Tsumo points (and no points for Dragon or Wind pairs). Use the special 25-point column in the chart. So. When your hand is pinfu, it's always concealed (you can't claim pinfu as a yaku if you've made any exposed chows). So now it's just a question of whether you win by discard (ron) or by self-pick (tsumo). Ron - you get 30 points and 3 fan - 1 fan for pinfu + 2 fan for going out. Tsumo - you get 20 points and 4 fan: 1 fan for concealed self-pick + 1 fan for pinfu + 2 fan for going Out. Ah. You've been on Jenn's site, then. (^_^) Ryan Morris calls pinfu "Flat Hand." the scoring chart on Jenn and Garth's Reach Mahjong website has a "N/A" for a 20�base point hand with 3 Hand Points (Hand Points�= Fan) for both dealer and non-dealer. And the scoring chart in the "Complete Reach Mahjong Online Rulebook" also shows a blank for a 20 base point hand, which would have to be the pinfu hand, right? Could you explain the "N/A"? I just looked at the scoring chart of the European Mahjong Association, and they don't have N/A in the 20pts/3fan cell. And Ryan Morris' scoring chart doesn't either - same for Wei-Hwa Huang's chart. But Alan Kwan's scoring chart shows a blank in the 20pts/3fan cell, like Jenn & Garthe's. As you can see by the little discussion above, you can get 20pts/4fan OR 30pts/3fan, but (at least with pinfu anyway), never 20pts/3fan. I guess the reason for blanking that cell on the chart is that there's no way to get 20pts/3fan. And if that's true (I haven't analyzed it that thoroughly to say for sure that it is), then the question isn't why Alan Kwan and Jenn & Garthe blank out the cell, but rather why others don't. Dou itashimashite. If you get the book, I hope it helps you. > scoring chart shows a blank in the 20pts/3fan cell, like Jenn & Garthe's." > booklet, but she didn't comment this. > site, I don't know? DOH! It's forehead-slapping time. In checking those other charts, I looked only at the one cell, without paying any attention to the numbers contained in those or neighboring cells. It's been so long since I actually used the Shanghai: Second Dynasty chart, I forgot. When looking up a score on the chart one only counts the yaku-based fan (ignoring the fan for going out) to find the appropriate cell. These charts include the 2 HP bonus for winning a hand. Modern charts often omit these two hand points and count 3 HP as 1 HP, starting with the one that was earned. This method works exactly the same, but requires only 1 HP to win, rather than 3 HP. So this lays to rest the question from "Beer/Ramen" as to why some charts show "N/A" in certain cells - when you allow for the difference in methodology for using the charts, you see that they are actually consistent with one another. May the tiles be with us all. >I noticed in certain games and shows, that the Japanese use a scoring method that looks similar to golf after a session. The numbers look like +33, or -5, or the like. I have scoured the net over and over for a source or method for how this scoring works, but all I've managed to find out was it had something to do with the number 30,000. Do you know what this scoring is, and how it works? I'm surprised this information wasn't in Ryan Morris' description or in the European Mahjong Association's description...? At the end of the game, players are ranked First, Second, Third, and Last. Also at the end of the game, the score (until now measured in thousands of points) is converted into smaller units. Mainly this is done so that if the players are gambling, they know how much to pay one another. Japanese players customarily see the endgame score displayed in one- or two-digit numbers. Players start the game with a bank of 25,000 points. At the end of the game, players are ideally supposed to attain a goal or target of 30,000 points. Shanghai: Second Dynasty allows you to vary the opening stake anywhere from 25,000 up to 30,000 (in 1,000 point increments) -- this example assumes your opening stake is 25,000. The goal amount is always 30,000. 1. Players' final scores are compared with the goal of 30,000 and it is determined how far off the mark they are. For example, if a player winds up with 35,000, then he's 5,000 ahead; if a player winds up with 24,000, then he's minus 6,000. 2. The player with the highest score is awarded the difference between the start points and goal for each player around the table (20,000 is added to his score). 3. Each player's score is divided by 1,000. If a score is not evenly divisible by 1,000 then the score has to be rounded first. If the "fraction of 1,000" is 500 or more, round up. If 400 or less, round down. For example, if a player had end score of 35,000 and then was awarded 20,000, his final score is +25 (20,000 winnings added to the amount of points over 30,000). 4. Now the player's final scores are compared to determine who is the Top player, who is 2nd, who is 3rd, and who is Last. 5. If a point spread ("uma") is used, it is calculated here. Shanghai: Second Dynasty's default point spread is 0-0, so no score difference is the usual result. But let's say you choose to use a point spread of 5-10. Add ten points to the Top player's score. Add five points to the 2nd player's score. Subtract five points from the 3rd player's score. Subtract ten points from the Last player's score. 6. When players are gambling, then multiply the final score (after calculating the point spread, if you so choose) times the previously-agreed monetary unit (usually either ¥100 or ¥1,000) to arrive at the payment amount. In the following example, we assume ¥100 payment. NOTE that in Shanghai: Second Dynasty, we do not use the bottom row of this chart (it is included in order to provide a complete understanding of how the Japanese scoring works in the real world). The entire Shanghai Second Dynasty help file used to be hosted at http://www.mahjongnews.com, but I don't know if it still is. How do 2 people win in Japanese majan? >In riichi mahjong, if a tile can be claimed by more than one player for a mahjong, what happens? Is the winning split? First person to the right of the person who's discarding gets the tile? When two people claim ron on a discard in Japanese riichi majan, the discarder pays them both. Why Won't The Computer Let Me Claim Mahjong? >Subject: Riichi Mahjong, How would one NOT be able to call win after declaring Riichi? >In the situation above, I am East. It is South 1st Round. >I declared Riichi, waiting on a two-sided wait for 1 Man and 4 Man. The hand is fully concealed, and I have Dora 2 at minimum (Red 5 Pin, as well as 4 Pin). The 4 Man from South was the last discard, as well as a tile I would need to win. As far as I'm aware, had I been able to win off the 4 Man, I would have have Riichi, Haitei, Pinfu, Dora 2. Is there a rule that could potentially be in place that could prevent me from winning this specific hand? See FAQ 25 (there's a link above left). The most common reasons for a computer game preventing a win declaration are furiten and below-minimum score. In real life there would be nothing stopping you from making your play, but other players would see that you'd made a mistake, and would hit you with a chonbo penalty. Some computer games disallow that kind of play (and some computer games give the option of permitting chonbo mistakes). In your case, there's a definite furiten. You said you're waiting for a 2-way wait, 1M / 4M. I looked at the other player's discards to see if you had missed something in the most recent go-around, and then I looked at your own discards. Have a look at FAQ 25, then look again at your discards. You are welcome to email me again if you still don't see it. May the tiles be with you. For other details about Japanese mahjong, strategy, and to get definitions for terms used above, etc., there are several websites listed in FAQ 4b. Gamegrunt's "Illustrated Riichi Scoring Reference" is available on BoardGameGeek. Want to play Japanese rules with only 3, or just 2, players? See FAQ 13. Want to play Japanese rules with a mahjong set made for Japanese "Reach" mahjong? Go to Reach Mahjong: The Only Way to Play - reachmahjong.com. Also a glossary, a monthly podcast, columns, discussion board, and a Ron2 tutorial. A downloadable English-language booklet has been made which describes the standard Japanese riichi/dora majan rules of the European Mahjong Association. http://mahjong-europe.org/rules.htm. Direct links to the 24 page booklet and the 2 page summary: http://mahjong-europe.org/files/riichirules_EN.pdf ; http://mahjong-europe.org/files/riichisheet_EN.pdf . http://www.japanesemahjong.com/ - Ryan Morris' excellent English-language guide to Japanese mahjong is finally back online! Ryan Morris is a representative for the Mahjong Museum in Japan, and a columnist for Japan's manga, Kindai Majan. Miniature (17�12�10mm) acrylic tiles can be purchased at http://japanese-mahjong.com. http://eng.riichi.nl - European Championship Riichi Mahjong. http://www.ron2.jp/presentation.html Japanese rules, Japanese language. This is THE "reach" ("riichi") site for those who've graduated to playing online versus other human players (especially Yakitori Online members).